Prototype: "Veolia Transport" class 185.1 general-purpose locomotive. Dual system locomotive. 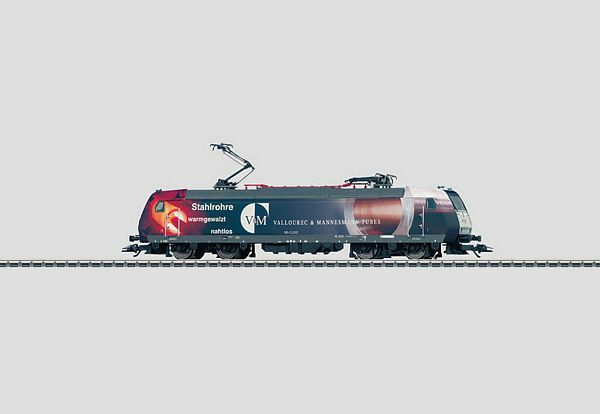 Model: The locomotive is constructed of metal with many cast-in details. The total design of the locomotive is ideal for model railroad operation. It has a digital decoder and a special can motor. 4 axles powered through cardan shafts. Traction tires. The triple headlights are maintenance-free LEDs, they change over with the direction of travel, will work in conventional operation and can be controlled digitally. The locomotive has 2 pantographs that can be raised and lowered manually (they are not wired to take power from the catenary). Length over the buffers 21.7 cm / 8-9/16. This model can be found in a DC version in the Trix H0 assortment under item no. 22076.